It is conventional wisdom that hydropower is ‘modern’ technology, but Nepalis have harnessed the energy of falling water for centuries. There are an estimated 30,000 water mills all over Nepal, traditionally used in villages to grind grain. With some investment and a little upgrading, a traditional water mill (called ‘ghatta’) can be modified to hull rice, extract oil, and even generate electricity. The Multi-purpose Power Unit design has been available to Nepali farmers since the 1980s, however, it is in the last decade with the crippling shortage of electricity that it is being pushed as an alternative source of energy for rural Nepal. Considering that the national grid will take at least 25-30 years more to reach remote areas, it is the most cost-effective option to provide electricity in the near future. Nearly half of households in Nepal still do not have electricity, and even those that do suffer severe power cuts. The government has heavily subsidised solar panels for rural areas, but seems to have so far failed to push more efficient water mills. The improved water mill replaces the wooden paddles on traditional ghattas with metal turbines on ball bearings that are more efficient. With increased energy output, its potential as a source for agro-processing as well as electricity generation is enhanced. At Phoksintar of Kavre District, the Centre for Rural Technology Nepal (CRT/N) has demonstrated that improving existing ghattas can transform rural agriculture processing with mechnisation. In 2007, CRT/N received the prestigious Ashden Award from Al Gore for its work with improved ghattas. Biplav Kafle of CRT/N explains: “During the day, the local residents use the improved mills to grind grain such as corn and rice and in the evening and night they use the same machine to light up their homes.” Some 28 households benefit from electricity that is supplied from 6pm to 6am. The Centre works with the Dutch group, SNV and the Alternative Energy Promotion Centre (AEPC) to make an improve mill design from the 1980s even more efficient and versatile. The program got a boost from the German GIZ/Energising Development (EnDev) in 2013 to focus more on the electrification component of improved water mills. From 2002-2010, more than 7,000 improved mills have been installed in districts such as Panchtar, Ilam, Sindhupalchok, Dhading, Jumla, Dadeldhura, Dolakha and Surkhet. In Kavre district alone, the program has replaced kerosene lamps with electricity in 200 households in four VDCs. (Hover over the infographic for the exact number of improved water mills built each year). The output power capacity of an improved water mill is 0.5-3.0 kw and it can grind 20- 50kg of cereal grains per hour, whereas a traditional ghatta can only produce 0.2-0.5kw and grind just 10-20 kgs of grain per hour. The improved mills are also easier to maintain and have a longer lifespan. “Once the installation is done, we visit frequently to check if the water mill is well maintained. The lifespan of traditional water mills was only two years, but the improved mills last up to ten years,” says Shiva Sharan Shrestha of Kavre’s Ghatta Owners’ Association. However, in spite of its long life span, some of the improved water mills do not run effectively. The donor agencies are working on an extensive business model to prevent such issues from occurring frequently. Improved mills have the capacity to transform rural lives by removing drudgery, saving time and bringing electric lights to homes in remote areas. And as Kavre has demonstrated, it is the village women and children who benefit the most. “Before the improved water mill was installed, we used kerosene lamps for lighting. Kerosene was smoky and expensive, and often we would run out. But now we have bright electric lights all night, it has become much easier to work,” says Kanchi Maya Ghising of Phoksintar. The improved mills do not just replace the traditional ghatta, but also the manual dhiki and janto. They save time and minimise the workload of women and children involved in agro-processing and allowing them more time for other purposes such as farming, caring for children and participating in community affairs. Phoksintar has a nine member user committee which manages the mill and distribution of electricity, two of them are women. 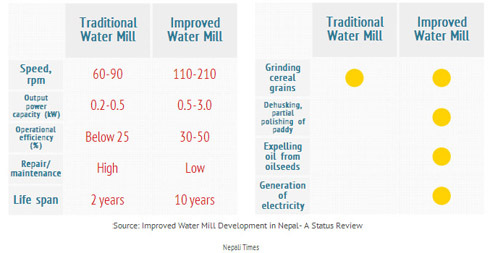 Nepal’s improved water mill program aims to put up 4,000 new units by 2017, and will be on its way to convert all traditional water mills and also install new ones. It is quite possible that rural Nepal will soon have more reliable electricity than the cities. Just like electricity rationing is here to stay for at least another six years, the water shortage is bound to get worse in the coming years before it gets better. The only option may be to harvest rainwater where it falls: on your roof. It is simple, it is free, it is logical, and it is the only solution. The only trouble is that 80 percent of the rain in Kathmandu falls between June and September. This rain has to be stored in big enough tanks so that it lasts the dry season from from October to May. This means rainwater storage in Kathmandu is more expensive than other parts of the world. Still, a round-the-year rainwater cistern is the only one-time expense. 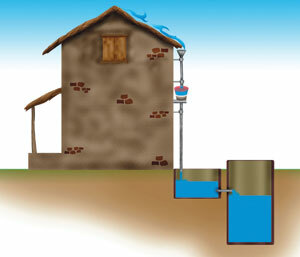 A basic roof rain collector costs Rs 50,000, with additional expense depending on the size of the storage tank. This may sound expensive, but if you factor in peace of mind, it is a viable proposition. In 2012 Kathmandu Valley Water Supply Management Board under the Ministry of Physical Planning and Works launched a campaign to harvest and recharge five million litres of rainwater inside the Kathmandu Valley but the campaign wasn’t so successful. “People are a lot more aware about rain water harvesting now, but they aren’t willing to spend thousands of rupees to install the system,” says Rabin Man Shrestha of the KMC. Poor governance and instability are preventing Nepal from taking advantage of its abundant water resources and ensuring water security for its people, a new analysis shows. Researchers at the University of Southampton in UK argues that Nepal needs an integrated water management system that takes into account the links between water resources, governance, and accessibility, and the water-energy-food nexus. “Integrated water resource management requires active role of institutions,“ says John Duncan, co-author of the analysis published in Environmental Science Policy last November. Such an environment is lacking in Nepal and will subsequently affect water security and sustainability, says Duncan. Will Nepal really benefit as a transit for India-China trade?